Comments On The Physics Today Article “Science Controversies Past and Present” By Steve Sherwood | Climate Science: Roger Pielke Sr. In the October 2011 issue of Physics Today, there is a 6 page article that presents an inappropriately narrow perspective on climate science, as well as ridiculing those who disagree with the author [this is one of two such articles with this viewpoint -I will post on the second article this coming week]. The author, Steve Sherwood is a codirector of the Climate Change Research Centre at the University of New South Wales in Sydney, Australia. Reactions to the science of global warming have followed a similar course to those of other inconvenient truths from physics. My Comment: Steve Sherwood is careless with his facts (and the referees failed to identify such errors), where he wrote “human greenhouse gas emissions dominate natural ones“. The human input of CO2 is dwarfed by the natural input and extraction annually; e.g. see the figure below from NOAA’s ESRL. What Sherwood should have said (and the referees should have insisted on) was that “the annual averaged human greenhouse gas emissions dominate annual averaged changes in natural emissions and extraction“. Although nearly all experts accept that the greenhouse gases emitted by humans have caused significant warming to the planet and will likely cause much more, only about half the US public agrees, even after years of heavy media coverage. How did we get into such a mess? What are the implications for science, for how it should be communicated, and for how debates should be interpreted? Some insights may be gained by noting that global warming is not the first “inconvenient truth” in physics…. 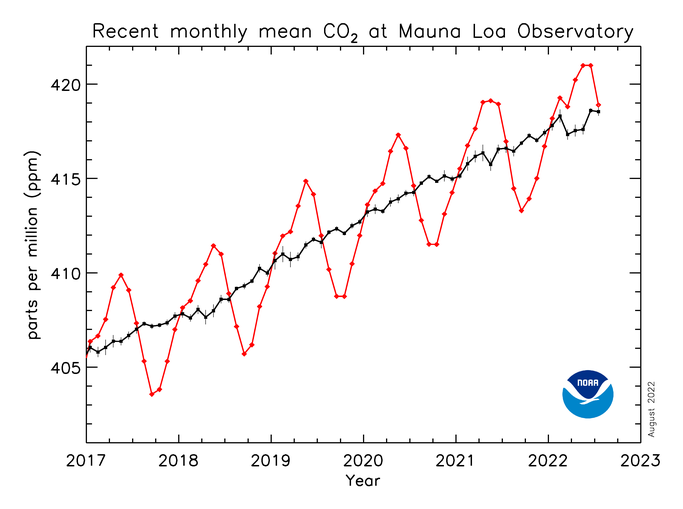 Greenhouse warming today faces an even greater array of bogus counterarguments based on the uninformed interpretation of data from ice cores, erroneous views about natural carbon sources, alleged but unobserved alternative drivers of climate change, naive expectations of the time scales over which models and observations should match, and various forms of statistical chicanery and logical fallacy. Many of the arguments sound reasonable to an inexpert but intelligent layperson. Critics use the alleged ﬂaws to attempt to discredit the entire field. My Comment: “Many of the arguments sound reasonable to an inexpert but intelligent layperson” because they better fit with reality! For example, he writes about “alleged but unobserved alternative drivers of climate” but fails to identify what these are. This is another clear failure in the article. There are a multitude of other human and natural climate forcings, as summarized, for instance, in the book The Climate Fix and in Pielke Sr 2008. Steve then insults those who disagree with him. Debates between mainstream scientists and silver-tongued opponents cannot be won by the side of truth no matter how obvious the fallacies may be to an expert. Incredibly, as recently as the mid-19th century, a highly charismatic figure calling himself “Parallax” devoted two decades of his life to crisscrossing England arguing that Earth was ﬂat. He debated legitimate astronomers—sometimes teams of them—in town-hall-type settings and wowed audiences.10 For similar reasons, Einstein himself gave up debating his critics early in the 1920s. The hubris in the article is amazing. It took both Copernicanism and greenhouse warming roughly a century to go from initial proposal to broad acceptance by the relevant scientific communities. Greenhouse warming and its perceived policy implications challenge widely held libertarian ideals and provoke economic fears, as evidenced by the negative correlation between acceptance of anthropogenic climate change and coal production, especially among the wealthiest nations. Sadly, some new textbooks in climate and atmospheric physics are being written with long prefaces explaining why students should believe what the textbook says, despite contrary information from their parents, radio talk show hosts, or the internet. Normally a textbook does not have to defend itself. Since modern science, and physics especially, is done primarily at the pleasure of the taxpaying public, such developments should concern all scientists. At the same time, history tells us that in the end, science will probably come out fine. Whether the planet will is another matter. Is is disappointing that this article appeared as a “feature article” rather than an opinion piece in Physics Today or elsewhere. It is yet another example of using a scientific journal to advocate a particular perspective on the climate change issue and to disparage those with whom they disagree.